Barbara Parkins is best known as an icon of the Sixties who had starring roles in two of the era’s more notorious productions, Peyton Place (1964) and Valley of the Dolls(1967). 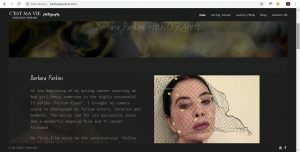 Latterly, she is a photographer and I created her website which was designed to showcase almost 200 of her photos. This was an e-commerce project so customers can select the photos on her site which directs them to Shopify where they can purchase them. Shopify is then linked with Creative Hub which automatically fulfills the orders.